Corvus is a small parts pack based around a 1.25mTwo seat capsule. It has been made to be a "Kerbalized" interpretation of Gemini. Also included is an appropriately themed parachute/ docking port combo, a service module, and a small in-line monopropellant engine. The pod features a unique IVA. A heatshield and decoupler have been added in the newest update. -A portion of HGR is included in this DL and only includes props for the IVA. You will not have seats without this. Corvus Extras is an additional download that adds some extra Gemini themed parts to use with the Corvus. These are completely optional and only available here. 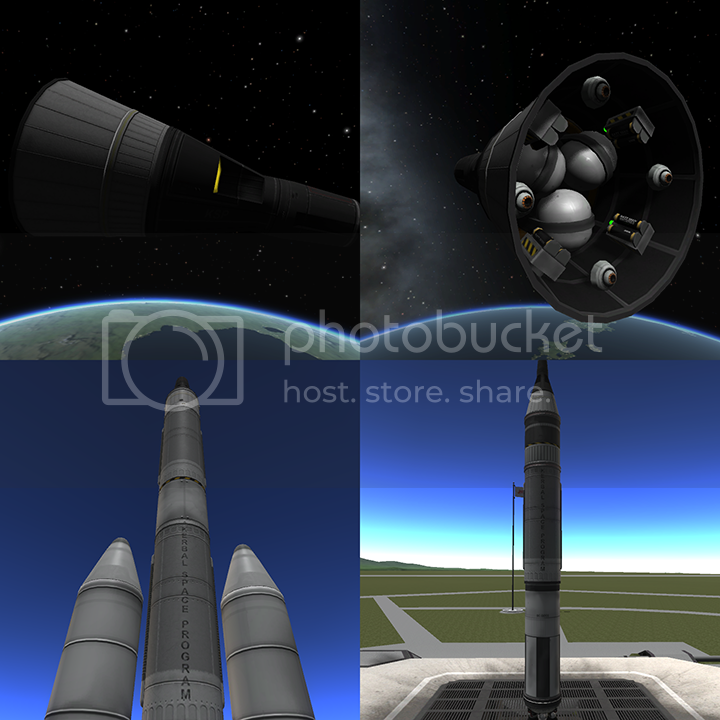 Currently there is a Titan II themed fuel tank and a 1.875m adapter to give the Corvus a more traditional Gemini look. Looks awesome! Would you ever consider making a white version? EDIT: Dear god, the way the service module, built in RCS, the monoprop generator, parachute, docking module all work perfectly together... is seriously awesome. I wish there were more combined docking module/parachutes! That's flippin' awesome; I love it. I've been looking for a 2-man pod with a style I liked. This is absolutely perfect! Glad to see this little guy again! I think it would be more "specific" to call it a jackdaw. But seriously looks good thanks for the mod. Bless you! I've been crying for an update since KSP release. There's really space for 2 Kerbals in this? But I like it very much - I missed a small 2-Kerbal size 1 pod for a long time. There are some, but none really looks so nice (personal taste of course). Do you plan to make it part of HGR? CEO of Cyclone Aerospace Corp. Yes, upon a quick google search, you're probably right. No, HGR really focuses on a different scale and I'm panning to remake the Radish. It's a lot more roomy than the Corvus and I feel 1.875m is a more appropriate size for a gemini style pod. 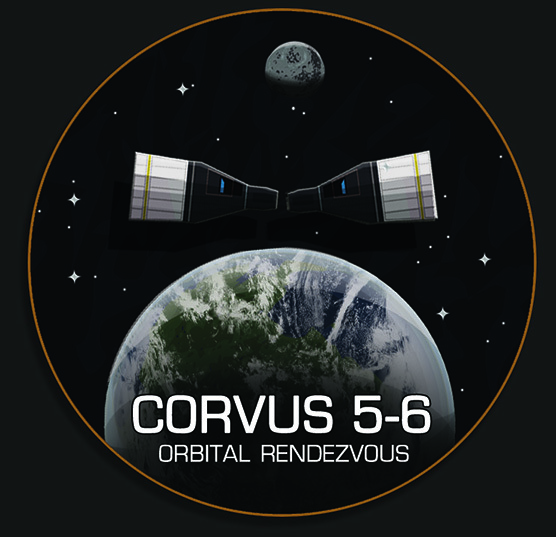 The Corvus is more of a side project, and something for those that understandably don't want to commit to a new part diameter, especially one as niche as 1.875m. I do want to make an optional adapter available that would allow the corvus to look nice on 1.875 parts, so that it could be used with HGR and Angel-125's MOL mod. Hey, thanks for the patch! Mind if I use it in the mod? I'm afraid I'm not very good at making realchute .cfgs myself. I love having an early-game two person pod, and I've been using this one (with the unofficial patch, until this morning) instead of the Radish because it fits with the stock heat shields. This just replaced K2 for me. Any chance of this having RPM integration? Yup, planned for the next update. Ditto. Looks fantastic - and I love the IVA. I use RPM, but I actually like the idea of having the first couple of capsules on the TechTree lack the RPM consoles. Just need to figure out how to make the Mk1 RPM config tech-unlockable! I've started playing with this and it really does look and act amazing. Are you planning on doing any retexturing? I noticed the "KSP" letters looked a little askew, probably from how it wrapped around the shape. Also, normal maps would be nice for the capsule seams and the engine textures. The long one is that I actually made this about six months ago and just recently came back to it. In that time we discussed a lot that could improve the whol system, such as turning the service module into more of a payload bay and making the engine dual mode to support both LFO and Mono prop. Check out the dev thread for more details. Texture wise, it actually has a normal map, it just isn't a great one. But the whole system uses texture sharing in a way that I'm unhappy with and strange mapping in a few places. (Again I made this quite a while ago and hindsight is 20/20) So a lot needs to be redone and it sort of needs to happen at the same time. If I find myself with a lot of free time I can look into improving the existing normal map, but I don't want to devote too much into fixing textures that will need to be remade anyway. Hope that makes sense and isn't too disappointing. The windows on this pod are much larger than any other pod in the game... any chance of making them smaller? But I doubt you want to mess with the model:wink: Either way, it's a nice looking single part-set (with IVA!) 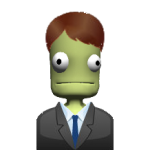 for two Kerbals that is definitely missing from the stock game. At least, for people like me who don't want to get into a whole other 1.85 meter set of parts. Awesome! Just rescued Chadbutt Kerman from LKO. Any word yet on the 4 man capsule? Hey, I love the mod. I noticed there isn't a heat shield or decoupler included with one I downloaded. Is this true? Could you add a decoupler or heatshield please? The stock ones are quite jarring when used with this mod. I prefer to use the 1.25m Deadly Reentry heatshield with a KW Rocketry decoupler. Both are very low profile and the KW decoupler is close in tone to the Corvus' textures. The CST style one from the dev thread? I've been working on some HGR stuff lately as far as asset creation goes, so it might be a bit before I get back to it. I do intend to finish it at some point. A heatshield could be a possibility for the future. I may even be able to have it act like a decoupler with a bottom detachment node, possibly. My biggest issue with the stock heatshields is actually the size of their auto shrouds. They stick out a bit too far for my taste. The DRE heatshield is a good fit if you're running that mod. Not sure if their's a version with stock ablator available.